Its elevated position gives wonderful all round panoramic views of the L'Hermitaine valley. The Chateau has a 12mx6m swimming pool with Jacuzzi and is surrounded by private 15 acre gardens and grounds, terraces and woodland paths, leading down to a wild trout stream. The chateau offers a stylish and comfortable standard of group accommodation for up to 16 guests, set in an idyllic yet practical country location. Situated in the heart of Deux-Sevres renowned for its traditional French hospitality and events the chateau is located just 45 minutes from Poitiers and its airport, 20 minutes from Niort and about an hour's drive from La Rochelle and the Atlantic coast. It is an ideal base for an endless list of possible activities for all seasons. The A10 motorway (Paris-Bordeaux) is just 10 minutes away. The local train station has a direct TGV train connection to Paris (2 hours travel). The chateau originally dates from the 13th Century and in 1689 was donated by Louis X1V to the family Devernou. It was rebuilt in the 19th Century, hence its picture book neo-gothic architecture and stylish accommodation. A stone spiral stairway leads down to the oldest part of the Chateau where you will find: Kitchen/dining room - large 45 sqm room, which comfortably seats 12 persons or more. It is newly equipped and fitted with dishwasher, induction hob, electric oven, microwave and fridge. There is an adjoining vaulted wine cellar and utility rooms with fridge/freezer, washing machine and drying area. The ground floor area has high ceilings, French doors and balconies throughout and consists of: Entrance Hall - generous space. Small room - with office facility and small kitchenette with fridge. 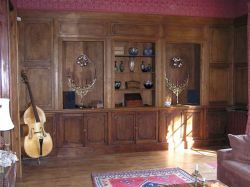 Red Salon - with wood panelling and fabric decorated walls. It is equipped with television, satellite, DVD and stereo. It opens out to a large elevated balcony ideal for summer dining and overlooking the beautiful wooded valley. Blue Salon - elegantly furnished with open fireplace. This room leads onto a garden terrace which enjoys all day sunshine and overlooks the carp pond and chapel. Cloakroom. 8 large bedrooms and most have balconies. 5 double bedrooms - en-suite. Double bedroom - plus a single bed. Twin bedroom - which could accommodate a further 2 beds/cots. Twin bedroom. 5 bathrooms - each of which are spacious. 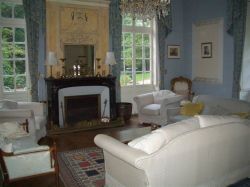 The chateau has oil central heating and we also provide wood for the open fires during the winter. Surrounded by its charming park overlooking the picturesque valley of the river L'Hermitaine. Its woodland paths lead down to private access to a wild trout stream. There is a private 12mx6m pool and plenty of safe space for the children. Supermarkets are 10 minutes away and the nearest boulangerie (which also offers essential provisions) is just 1.9 km away. Cognac - Visit the world renowned distilleries, 90 minutes. Bordeaux - Vineyards and viticulture. Airport, 90 minutes. Niort - An historic and lively castle town offering excellent shopping, markets, restaurants, and sight-seeing (river, churches, dungeons etc. ), 15 minutes. Poitiers - Historic town and gardens offering shopping, markets, restaurants, entertainment and sight-seeing, 40 minutes. Parthenay - A traditional town surrounded by ancient ramparts offering authentic shopping, markets, fairs, restaurants and entertainments, 40 minutes. Tumulus de Bougon - Prehistoric (2000BC) burial site and museum, 30 minutes. Sanxay - Roman archaeological site with temples, baths and amphitheatre, 30 minutes. Farmers Markets - St. Maixent, Niort and many more. Military Museum- St. Maixent L'Ecole. Route de Chabichou - Tour of the areas famous for its goats cheese farms. Balance to be paid - 9 weeks prior to hol to arrival.